Scheduled to debut at Milan Design Week from April 12 through 17, the Setsuna concept defies the notion that cars should only be seen as industrial products loaded with the latest technologies. 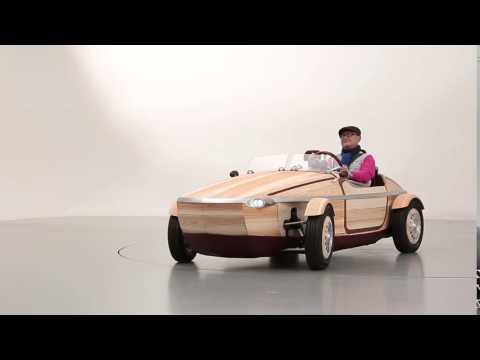 Toyota's unique wooden roadster was conceived to embody the affection owners grow to feel for their cars, and to show how cars continue to change and offer new value as they are taken care of with love over time. Here are some of the ways in which Toyota engineer Kenji Tsuji and his team have conveyed these ideas throughout the Setsuna's unique design. The short hand in the meter's aluminum case displays the time of day (one circuit is 24 hours), while the long hand shows the passing of days (one circuit is 365 days) and the counter meter displays the passing years. This 100-year meter continues to display the passage of time throughout the history of a family as the Setsuna remains constantly by their side. Even when the car is passed on to new generations, the meter continues to turn, taking on a value linked to the memories of a family. These momentary memories build up over a long time, making the car ever-more essential, and a beloved family member in its own right. The idea of "the accumulation of moments" has been expressed through a radial, circular emblem. The design evokes a clock that shows each individual moment, while simultaneously giving the impression of a moment blooming like a flower. The hope is that both family and car will continuously grow together, just as trees grow larger and stronger ring by ring. Wood was used as the material for this vehicle as a means of expressing the idea that love grows as time passes. The color and feel of wood changes as it is cared for. It responds directly to the love that it is given. As the Setsuna is repeatedly passed on from generation to generation, it is transformed into a car that belongs only to that family. Physical changes to the car embody the changing nature of its bond with its owners, representing memories of time passed together. Despite being a concept car, the Setsuna offers basic vehicular performance and is able to drive, turn, and stop. In order to achieve this, each type of wood—including wood selected for use in components—was selected for a specific application. For the exterior panels, Japanese cedar was selected for the vividness and refinement of its wood grain and its flexibility as a material. For the frame, Japanese birch was selected for its strong rigidity; for the floor, Japanese zelkova was selected for its strength and excellent durability, and for the seats, the smooth-textured castor aralia was selected. To fully express the beauty of certain wood grains, two patterns of Japanese cedar can be exchanged to make up the exterior panels of the Setsuna. These two patterns are the straight grain, cut toward the center of the logs, and the cross grain, cut at an appropriate distance from the center of the logs. The straight grain gives a formal impression with the grain showing sharply and evenly. In contrast, the cross grain is softer and more irregular, with different types of grain visible in each piece of wood, creating a quaint and friendly impression. Traditional Japanese techniques such as okuriari and kusabi were used so that the wood could be joined without nails or screws. Okuriari, which allows the exterior panels to be fitted and taken off without using any nails, not only increases the strength of joints but also makes it possible to make partial changes to dovetailing and mortise joints if the fastenings have worn down. This means it is possible to continue using the car without additional processing of the main body. In joints of the frame, split tenons are fastened to through tenons that have been pushed through several parts to hold the frame together. This detailed care applied to the making of the Setsuna through wood-only joining techniques is an important facet of its unique personality. The Setsuna's body is composed of 86 handmade panels. Considerable thought was given to the design and creation of each panel from the outset, and each of these panels will develop and change differently as the car ages. Eventually, when repairs become necessary, individual panels can be replaced rather than needing to replace the entire body. Looking at a panel that has been repaired, owners will be able to see the traces of where work has been done by hand, and sense the memories that have been passed down. The lacquer finish used on parts of the vehicle has been carefully applied by hand. To bring out the grain of the wood, wipe-lacquering has been used for the door mirrors, seats, steering wheel, and body banding lines. Rather than normal lacquer, which is applied in layers, this method involves repeatedly applying lacquer to the surface and wiping it to set the lacquer along the grain of the wood, creating a combined texture from the wood grain and the lacquer. The intensity and color will change with use over time, becoming even more beautiful and evoking a completely unique impression at different moments spread out in time. We aimed to create comfortable seats that give the impression of being able to kindly welcome and embrace anybody, like a wooden park bench. The castor aralia timber of the seats has been lacquered and the parts that come into most contact with the body have been covered over with leather. The character and depth of the wood, lacquer, and leather in these two seats all evolve with time to gently embrace each member of a family. Aluminum has been used in parts such as the wheel caps, the steering wheel, and the seat frames. This creates a beautiful contrast that is also in harmony with the Setsuna's wooden parts. Like wood and leather, metal also changes in character over time, making it a material that can feel well-loved. We hope for people to love not only the beauty created by each of the materials and their combinations, but also the way the car changes over many years. As the wooden materials slowly bend over time, the body line takes on a more pronounced, beautiful curve, like a boat. When viewed from the front, a heptagonal shape can be seen, and when viewed from the sides or from above, the form can be interpreted as elliptical. With the car's boat-like exterior, one might envision a family setting out on a trip to the ocean. The Setsuna can actually be driven. However, it cannot be driven on public roads like a normal car. Though this is a concept car, we hope to communicate the joy one might find in driving it. Therefore, we truly hope that a day will come when all of you can have the experience of test driving this vehicle. "When we created the Setsuna, we envisaged a family pouring its love into it over generations so that the car gains an irreplaceable value. Continuous development is possible in the form of bonds between the car and the family, like the growth rings of a tree. To proceed with the development of a car utilizing the appeal of wood, we directly spoke with experts with wide-ranging knowledge, including carpenters specializing in temple and shrine construction and ship's carpenters. Furthermore, during this project, Sumitomo Forestry, a company that fully understands our concept, shared their knowledge of wood construction with us, and together we engaged in various types of joint development from the early stages, including wood selection and proposals for processing techniques and assembly methods. While we used wood as the main material, we also poured lots of time and passion into the car itself with our colleagues, creating a prototype and evaluating it so that the car would offer basic performance in the form of driving feel and comfort. By displaying the Setsuna, which was created with these hopes in mind and receiving a wide range of opinions, we believe that we can further improve this concept. One piece of feedback that we received in particular was the hope that we would incorporate this concept into car manufacturing in the future." 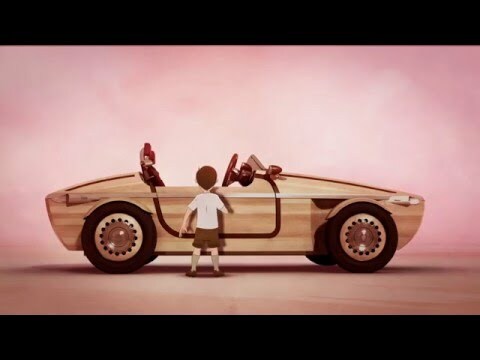 As this concept video unfolds, we see an old man flash back to when he was but a child who came to regret his mischievous graffiti on the body of his family's car and was moved to tears. Having become a part of the car through the years, that engraving accumulates meaning of its own and takes the form of a happy memory, transforming the car itself into another member of the family.